The Beautiful and attractive designer Portly perfectly made for top and Golden bow Basket in bottom With fancy look shall impress your guests. Purpose to gift as give aways for Baby Announcements Mehendi, wedding Return favours, Baby showers or can be used as engagement ring platter/ or can be filled with dry fruits, choclates, . Attractive & Sleek design adds to the ambiance of your home.Ideal for Birthday Parties, Wedding and Anniversary parties For Baby Shower for return gift. it can be used as Wedding favour or can be used as part of decorations. 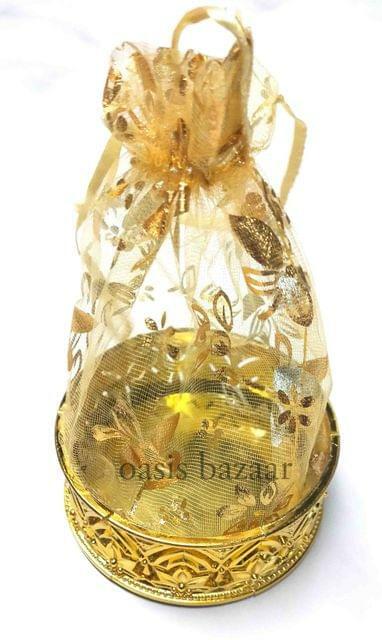 Best and Popular packaging option for party favors and wedding decorations.